The goal of surgical treatment of basal cell carcinoma (BCC) is to destroy or remove the tumor so that no malignant tissue is allowed to proliferate further. Factors to consider when choosing therapy include the histologic subtype of BCC, the location and size of tumors, the age of the patient, the patient's ability to tolerate surgery, and the expense. Recurrent tumors are generally more aggressive than primary lesions, and subclinical extension also tends to be increased. Tumors that are aggressive and those occurring near vital or cosmetically sensitive structures are best treated with methods that allow for an examination of the tissue margins. Knowledge of the behavior of the different clinical and pathologic types of BCC is essential in choosing the appropriate therapy. The most common surgical methods of treating BCC are curettage, excision with margin examination, and Mohs micrographic surgery (see the image below). Radiotherapy is another common BCC treatment, and cryotherapy is sometimes used. BCC recurrence after irradiation makes surgery mandatory. Postoperative wound after Mohs micrographic surgery demonstrates the extensive subclinical involvement that is typical of many infiltrating and morpheaform basal cell carcinomas. Go to Basal Cell Carcinoma and Basal Cell Carcinoma Guidelines for more complete information on this topic. Electrodesiccation and curettage is the most widely used method for removing primary BCCs. Although this technique is quick to destroy tumor cells, its adequacy cannot be assessed immediately, as the surgeon cannot visually detect the depth of microscopic tumor invasion and surgical margin. A looped blade (curette) is used to vigorously scrape tumor away from adjacent normal skin. One may start with a larger curette to debulk the tumor and then follow with a smaller curette to better remove smaller fragments of tumor from surrounding stroma. This technique works best on nodular or superficial BCC, because these tumors tend to be friable and do not tend to be embedded in fibrous stroma. The instrument is applied firmly and used in multiple directions over the tumor and immediately adjacent skin. Curetting is often followed by electrodesiccation, and the entire process may be repeated 1-2 more times. If electrodesiccation is not performed, vigorous and firm scraping in several directions is especially important. Many recurrences after curettage are believed to be due to insufficient aggressiveness on the part of the surgeon. The overall cure rate exceeds 90% for low-risk BCCs. The method is quick, simple, and less expensive than most other methods. Curettage is a relatively blind technique in which the specimen cannot be examined for margin control. This lack of microscopic margin control limits the usefulness of curettage in high-risk areas, such as the face and ears. Furthermore, the aggressive subtypes of BCC, such as morpheaform (sclerosing), infiltrating, micronodular, and recurrent tumors, are usually not friable and therefore unlikely to be removed by using the curette. The success of this treatment, even in nonaggressive tumors at low-risk sites, is highly dependent on the operator's experience and technique. Finally, healing by secondary intention (granulation) often leads to atrophic, white scars that may not be satisfactory in aesthetically important areas. Electrodesiccation and curettage is a brief procedure (<5 min) and is effective in treating primary nodular and superficial BCC. Cure rates are as high as 95%. Tumors ranging from 2-5 mm in diameter have a 15% recurrence rate, whereas tumors with a diameter of 3 cm or greater have a 50% recurrence rate within 5 years when treated by this procedure. The success of electrodesiccation and curettage is operator dependent and often leaves a white, atrophic scar. The procedure is less effective on the nose, and the tumor often tracks down pilosebaceous units. Electrodesiccation and curettage is less effective than Mohs micrographic surgery in treating the infiltrating, micronodular, morpheaform (sclerosing), and recurrent types of BCC; Mohs micrographic surgery is considered the treatment of choice in most of those cases. The curettage and cauterization procedure is not suitable for patients with cardiac pacemakers or for the treatment of morpheaform lesions, deeply invasive and ulcerated lesions, or recurrent tumors with ill-defined borders. After adequate anesthesia is administered to the patient, the tumor is scraped using a curette. This is often repeated twice more. This procedure is brief (<5 min) and is effective in treating primary nodular and superficial BCC. Cure rates may be as high as 95%, although this method has been studied less than has electrodesiccation and curettage. Curettage alone is believed by some authors to have a better cosmetic outcome than that of electrodesiccation and curettage. This procedure is neither widely accepted nor commonly performed. The success of curettage is operator dependent and often leaves a white, atrophic scar. It is less effective on the nose, and the tumor often tracks down pilosebaceous units. Curettage is less effective in treating the infiltrating, micronodular, morpheaform, and recurrent types of BCC than is Mohs micrographic surgery, which is considered the treatment of choice in most instances. After adequate anesthesia has been administered to the patient, the tumor is scraped using a curette. The newly formed ulcer is then ablated, along with a narrow (<1 mm) margin of adjacent epidermis. This is often repeated 2 more times. Curettage with Er:YAG laser ablation is brief (<5 min), is effective in treating primary nodular and superficial BCC, and is believed by some authors to have a better cosmetic outcome than does electrodesiccation and curettage. Cure rates may be as high as 95%, although this procedure has been studied less than has electrodesiccation and curettage. Curettage with Er:YAG laser ablation is less commonly performed than electrodesiccation and curettage. The success of the procedure is operator dependent and may leave a white, atrophic scar. It is less effective on the nose, and the tumor often tracks down pilosebaceous units. Curettage with Er:YAG laser ablation is less effective in treating the infiltrating, micronodular, morpheaform, and recurrent types of BCC than is Mohs micrographic surgery, which is considered the treatment of choice in most instances. A carbon dioxide laser is applied most frequently to the superficial type of BCC. This procedure may be considered when a bleeding diathesis is present, as bleeding is unusual when this laser is used. This procedure provides a bloodless field, minimal postoperative pain, and good postoperative appearance without scar formation. In cases of superficial T1-T2 BCC, laser microsurgery appears to be a safe and effective treatment modality without conjunctival extension. After treatment, changes in skin color may develop, which may be seen within a few weeks or may take at least 1 year or longer to be apparent. Additionally, scars may be seen and hypertrophic (thick) scars have been reported. Laser ablation without curettage may have less scarring than traditional electrodesiccation and curettage, but comparative studies are needed. This procedure has been studied less than other methods, and a great variance in recurrence rates has been reported. Hypopigmentation may develop, which may not be apparent for a year or more. This method can usually be performed in an ambulatory setting and provides the pathologist with a specimen to examine the tissue margins. Healing time is generally shorter with sutured closure than with granulation, and cosmesis compares favorably with that of curettage. Surgical excision is operator dependent, as those who are more experienced may be better at detecting the clinical margins. To increase the likelihood of complete tumor removal, one must include a margin of normal-appearing skin in order to remove all clinically invisible tumor extension. The larger the amount of clinically normal-appearing skin removed, the higher the cure rate, although the more extensive removal leaves a larger surgical defect and a poorer cosmetic result in most patients. In most circumstances, a 3- to 4-mm margin of normal, clinically uninvolved skin is removed. Other reports recommend even larger margins. Basal cell carcinoma of the skin. Intraoperative view outlining the extent of resection (lateral view). The surgical resection involved zygomatic bone and the lateral orbit. The eye was spared. Basal cell carcinoma of the skin. Intraoperative view showing the extent of resection (inferior view). Pathologic evaluation of the excised tissue can be performed via routine paraffin processing, which may take 1 day or longer, or by using frozen sections, in which the results are available in as little as 15 minutes. Surgical excision usually produces good to excellent cosmetic results and cure rates as high as 95%. Surgical excision is operator-dependent, as those who are more experienced may be better at clinically detecting tumor margins and thus require smaller margins (removal of normal-appearing skin). Excision is less effective in treating tumors without clearly defined clinical margins (eg, infiltrating BCC, micronodular BCC, morpheaform BCC), and is far less effective in treating recurrent BCC than it is in treating primary BCC. If a positive margin occurs, additional surgery is needed. Surgical excision is more time-consuming and costly than curettage. In addition, this method requires the sacrifice of normal tissue to obtain acceptable cure rates. Margins of at least 4 mm are needed, even with the least aggressive BCCs, to achieve 95% cure rates and as much at least 8 mm for more aggressive tumors. If standard "bread-loaf" tissue sectioning is used, areas of margin involvement may be missed under microscopy, because only a small percentage of the peripheral and deep margins are evaluated. Mohs surgery involves removal of the clinically apparent tumor and a thin rim of normal-appearing skin around the defect. [11, 12] This saucer-shaped tissue specimen represents tissue adjacent to the tumor or the margin surrounding the tumor and is sectioned and marked so that the entirety of the undersurface and outer edges of the tumor are examined microscopically to minimize sampling error. Use of the frozen-section technique allows for an examination of tissue while the patient is in the office. The tissue is mapped microscopically so that if any foci of tumor persist, further excision can be directed to only those areas, to spare the normal tissue. After adequate anesthesia is administered to the patient, the clinically apparent tumor is often removed by curettage or excision. The surgeon then removes a thin layer of tissue (called a stage), usually less than 1 mm in thickness, from the surrounding epidermis and either the dermis or subcutis, which is then examined under the microscope. Mohs micrographically controlled surgery has the highest cure rate of any treatment modality for BCC (99% for primary BCC, 90-95% for recurrent BCC), spares as much uninvolved skin as possible, and is the treatment of choice for infiltrating, micronodular, morpheaform, and recurrent types of BCC. With the Mohs technique, almost 100% of the tissue margins are examined, compared with standard vertical (bread-loaf) sectioning, in which less than 1% of the outer margins are examined. Because relatively thin layers are taken only in areas of proven tumor, this technique is tissue sparing. Excision and repair can usually be performed on the same day. Of most importance, Mohs micrographic surgical excision has the best long-term cure rates of any treatment modality for BCC. Cryosurgery may be considered for small, clinically well-defined primary tumors. This procedure is especially useful for patients who are debilitated with medical conditions that preclude other types of surgery. Cryosurgery is a viable alternative in treating BCC involving the inner canthus, thereby minimizing damage to the lacrimal system. Generally, this procedure is not recommended for BCC, especially for morpheaform lesions, deeply invasive and ulcerated lesions, or recurring tumors with ill-defined borders. Although tissue sparing, this technique temporary leaves the wound open, and scarring or hypopigmentation may result. Liquid nitrogen is applied to the clinically apparent tumor. A temperature probe is inserted into the skin at a lateral margin. Treatment stops when the temperature at the lateral margins reaches -60°C. Most patients experience pain and swelling after the area thaws. Absolute contraindications for cryosurgery include patients with cold intolerance, cryoglobulinemia, cryofibrinogenemia, Raynaud disease (only for treatment of lesions on the hands and feet), platelet deficiency disorders, and morphea- or sclerosing-type of BCC. Relative contraindications to cryosurgery include tumors of the free eyelid margin. Caution should be used before treating nodular, ulcerative BCC that is greater than 3 cm or recurrent carcinomas following surgical excision. Edema is common following treatment, especially around the periorbital region. Eschar may form and may persist for about 4 weeks. Following treatment, permanent pigment loss at the treatment site is sometimes unavoidable. Atrophy and hypertrophic scarring, as well as instances of motor and sensory neuropathies, have been reported. Cryosurgery has good cosmetic results and cure rates when used to treat tumors with well-defined clinical margins (eg, nodular BCC). The procedure is a good option for patients who are not surgical candidates who are unable or unwilling to undergo radiation. Overall, BCC of the eyelid treated with cryosurgery has a high cure rate; in a study, 92% of BCCs treated did not recur during a mean follow-up period of 5 years (range, 1.6-8.4 y). Cryosurgery is also cost-effective and well tolerated. Cryosurgery success is operator-dependent, as accurate clinical detection of tumor margins increases the effectiveness of treatment. In addition, patients must be willing to endure the immediate posttreatment swelling, resultant necrosis of treated areas, and unpredictable scarring that can occur with this approach. This method is not commonly used for the treatment of BCC, except by a few experienced cryosurgeons. Patients apply imiquimod 5% gel topically to the tumor daily for 5 weeks. At the conclusion of the second week, liquid nitrogen is applied to the clinically apparent tumor. If available, a temperature probe may be inserted into the skin at a lateral margin. Treatment stops when the temperature at the lateral margins reaches -60°C. Most patients experience pain and swelling after the area thaws. One month after the completion of imiquimod, a second treatment with cryosurgery may be performed if the tumor appears to have persisted. Absolute contraindications for cryosurgery include patients with cold intolerance, cryoglobulinemia, cryofibrinogenemia, Raynaud disease (only for treatment of lesions on the hands and feet), platelet deficiency disorders, morphea- or sclerosing-type of BCC, and allergy to imiquimod or any of the ingredients contained in the preparation. Relative contraindications to cryosurgery include tumors of the free eyelid margin. As few studies exist, treatment should be used with caution, especially if one does not use a temperature probe. Other limitations are identical to those seen with cryosurgery. Both imiquimod and cryosurgery have good cosmetic results and cure rates when used independently for appropriate tumors. The procedure may be an option for patients who are not surgical candidates who are unable or unwilling to undergo radiation. Reported cure rates are somewhat promising, although larger studies are needed. Cryosurgery success is operator dependent, as accurate clinical detection of tumor margins increases the effectiveness of treatment. Therefore, there may be variability in cure rates between providers. In addition, patients must be willing to endure the irritation that is commonly seen during imiquimod treatment and immediate postcryosurgery swelling, resultant necrosis of treated areas, and unpredictable scarring that can occur with cryosurgery. For patients who are not surgical patients or cannot apply medication, photodynamic therapy is a viable option. Two treatment sessions are recommended. Moderate to severe pain and burning sensation is common, as is local redness. Cure rates are typically less than other commonly used modalities. American Academy of Dermatology. Basal cell carcinoma. AAD. Available at https://www.aad.org/dermatology-a-to-z/diseases-and-treatments/a---d/basal-cell-carcinoma. Accessed: September 3, 2015. [Guideline] National Comprehensive Cancer Network. Basal Cell Skin Cancer: Version 1 2015. NCCN. Available at http://www.nccn.org/professionals/physician_gls/pdf/nmsc.pdf. Accessed: September 4, 2015. [Guideline] Ad Hoc Task Force, Connolly SM, Baker DR, Coldiron BM, et al. AAD/ACMS/ASDSA/ASMS 2012 appropriate use criteria for Mohs micrographic surgery: a report of the American Academy of Dermatology, American College of Mohs Surgery, American Society for Dermatologic Surgery Association, and the American Society for Mohs Surgery. J Am Acad Dermatol. 2012 Oct. 67 (4):531-50. [Medline]. Silverman MK, Kopf AW, Grin CM, Bart RS, Levenstein MJ. Recurrence rates of treated basal cell carcinomas. Part 2: Curettage-electrodesiccation. J Dermatol Surg Oncol. 1991 Sep. 17(9):720-6. [Medline]. Barlow JO, Zalla MJ, Kyle A, DiCaudo DJ, Lim KK, Yiannias JA. Treatment of basal cell carcinoma with curettage alone. J Am Acad Dermatol. 2006 Jun. 54(6):1039-45. [Medline]. Horlock N, Grobbelaar AO, Gault DT. Can the carbon dioxide laser completely ablate basal cell carcinomas? A histological study. Br J Plast Surg. 2000 Jun. 53(4):286-93. [Medline]. Humphreys TR, Malhotra R, Scharf MJ, Marcus SM, Starkus L, Calegari K. Treatment of superficial basal cell carcinoma and squamous cell carcinoma in situ with a high-energy pulsed carbon dioxide laser. Arch Dermatol. 1998 Oct. 134(10):1247-52. [Medline]. Kavoussi H, Ebrahimi A. Treatment and cosmetic outcome of superpulsed CO2 laser for basal cell carcinoma. Acta Dermatovenerol Alp Panonica Adriat. 2013 Sep. 22(3):57-61. [Medline]. Silverman MK, Kopf AW, Bart RS, Grin CM, Levenstein MS. Recurrence rates of treated basal cell carcinomas. Part 3: Surgical excision. J Dermatol Surg Oncol. 1992 Jun. 18(6):471-6. [Medline]. Grabski WJ, Salasche SJ. 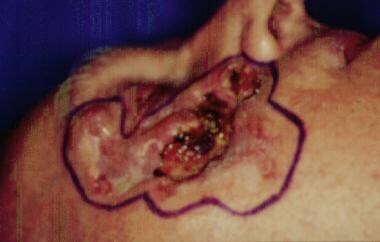 Positive surgical excision margins of a basal cell carcinoma. Dermatol Surg. 1998 Aug. 24(8):921-4. [Medline]. Bennett RG. Current concepts in Mohs micrographic surgery. Dermatol Clin. 1991 Oct. 9(4):777-88. [Medline]. Roenigk RK. Mohs' micrographic surgery. Mayo Clin Proc. 1988 Feb. 63(2):175-83. [Medline]. Lawrence CM. Mohs' micrographic surgery for basal cell carcinoma. Clin Exp Dermatol. 1999 Mar. 24(2):130-3. [Medline]. Smeets NW, Krekels GA, Ostertag JU, Essers BA, Dirksen CD, Nieman FH, et al. Surgical excision vs Mohs' micrographic surgery for basal-cell carcinoma of the face: randomised controlled trial. Lancet. 2004 Nov 13-19. 364(9447):1766-72. [Medline]. 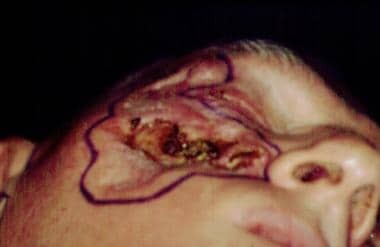 Ducic Y, Marra DE, Kennard C. Initial Mohs surgery followed by planned surgical resection of massive cutaneous carcinomas of the head and neck. Laryngoscope. 2009 Apr. 119(4):774-7. [Medline]. Tierney EP, Hanke CW. Cost effectiveness of Mohs micrographic surgery: review of the literature. J Drugs Dermatol. 2009 Oct. 8(10):914-22. [Medline]. Malhotra R, Huilgol SC, Huynh NT, Selva D. The Australian Mohs database, part II: periocular basal cell carcinoma outcome at 5-year follow-up. Ophthalmology. 2004 Apr. 111(4):631-6. [Medline]. Cherian P, Gunson T, Borchard K, Tai Y, Smith H, Vinciullo C. Oral Antibiotics Versus Topical Decolonization to Prevent Surgical Site Infection After Mohs Micrographic Surgery-a Randomized, Controlled Trial. Dermatol Surg. 2013 Oct. 39(10):1486-1493. [Medline]. Alam M, Ibrahim O, Nodzenski M, Strasswimmer JM, Jiang SI, Cohen JL, et al. Adverse Events Associated With Mohs Micrographic Surgery: Multicenter Prospective Cohort Study of 20?821 Cases at 23 Centers. JAMA Dermatol. 2013 Oct 2. [Medline]. Kaur S, Thami GP, Kanwar AJ. Basal cell carcinoma--treatment with cryosurgery. Indian J Dermatol Venereol Leprol. 2003 Mar-Apr. 69(2):188-90. [Medline]. Nakuçi M, Bassukas ID. Office-based treatment of basal cell carcinoma with immunocryosurgery: feasibility and efficacy. Acta Dermatovenerol Alp Panonica Adriat. 2013. 22(2):35-8. [Medline]. Arits AH, Mosterd K, Essers BA, Spoorenberg E, Sommer A, De Rooij MJ, et al. Photodynamic therapy versus topical imiquimod versus topical fluorouracil for treatment of superficial basal-cell carcinoma: a single blind, non-inferiority, randomised controlled trial. Lancet Oncol. 2013 Jun. 14(7):647-54. [Medline]. Schell AE, Russell MA, Park SS. Suggested Excisional Margins for Cutaneous Malignant Lesions Based on Mohs Micrographic Surgery. JAMA Facial Plast Surg. 2013 Jun 6. 1-7. [Medline].